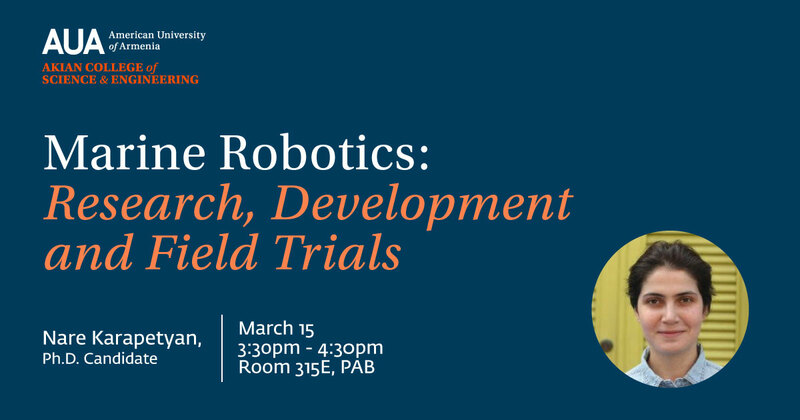 This presentation will cover the main problems field robotics are addressing and the challenges associated with them. The speaker will be presenting the research work performed at the Autonomous Field Robotics Lab (AFRL) at the University of South Carolina where she works. In particular, she will present her research work in area coverage – from algorithms that perform efficient monitoring in 2D environments to future work on mapping complex underwater structures. She will also talk about some platforms that have been developed in the lab and the challenges related with field trials. Marine environment is one of the most fascinating, challenging and full of undiscovered areas and species. Some of the problems related to this environment are: cleaning ocean from garbage, monitoring the life of coral reefs, discovering new species, exploring new regions, and many more. To efficiently and safely perform many of these tasks robots are the most appropriate tool. While many problems such as navigation or state estimation are already solved for ground robots, these are still open problems in the marine domain. Nare Karapetyan is a PhD candidate in Computer Science at the University of South Carolina. She is working at Autonomous Field Robotics Lab (AFRL) under supervision of Dr. Ioannis Rekleitis. Nare is working on area coverage and environment exploration problems using underwater robots and unmanned surface vehicles (AVS). Her works have been published in selective Robotics conferences such as ICRA and IROS. Nare is developing algorithms that help robots efficiently navigate in specific environments and collect information. In particular her PhD is extending to solve the coverage problem for Shipwreck mapping and coral reef monitoring. Nare received her Master’s degree in Computer Science from American University of Armenia and won Presidential Award as Best Master Student in IT sector. She is recipient of SPARC Graduate Research grant.